I did a year of eighteenth century art and literature during my degree and so had quite a bit to do with Joshua Reynolds and his fancy portraits of ladies. In The Ladies Waldegrave you can see the three daughters of the 2nd Earl Waldegrave working together on a piece of embroidery, showing off their lady skills and pretty faces, just in case you fancied marrying one of them. It's all very lovely, but we don't like any of that do we? We're Pre-Raphaelite people and we dismiss Sir Sloshua and all he stands for! Walter Armstrong, who had risen from a draper to become a merchant, saw Millais' triple portrait of the artist's daughters, Sisters in 1868 and wished to have such a portrait of his three daughters Elizabeth, Diana and Mary. Whether or not Armstrong was aware of the Reynold painting is uncertain, but Millais and his family were frequent visitors to Strawberry Hill, home of the Countess Waldegrave, so had ample opportunity to see the picture. The three Armstrong sisters were all approaching 20, the eminently marriage age for young ladies, and so rather than a painting of three little girls, this is a painting of three women who would (hopefully) make rather good marriages. 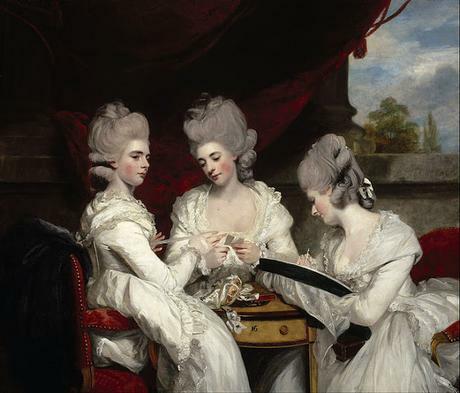 Reading more about the three daughters of Walter Armstrong, I was also reminded of another Reynolds portrait of three sisters. 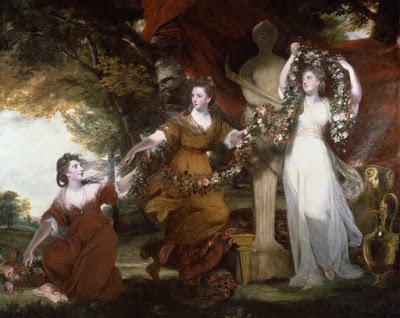 Three Ladies Adorning a Term of Hymen shows the Montgomery sisters celebrating how marriageable they are by hanging flowers around the god of marriage. The sister on the far right, who has gone past the statue has achieved marriage (hurrah for her!) and the other two are on the starting blocks. I wondered if there was something like that going on with Hearts are Trumps. Walter and Mary Armstrong's daughters Mary, Diana and Elizabeth are shown in highly fashionable, bustle dress, seated in a conservatory, playing dummy whist. Looking up at the Reynold's original, the Armstrong girls are in equally elaborate dresses but far simpler hair than their Waldegrave equivalents and rather than doing needlecraft, the girls are playing cards. This apparently caused a little friction between Walter and Millais, as Walter allegedly disliked the idea of his girls doing something so vulgar. 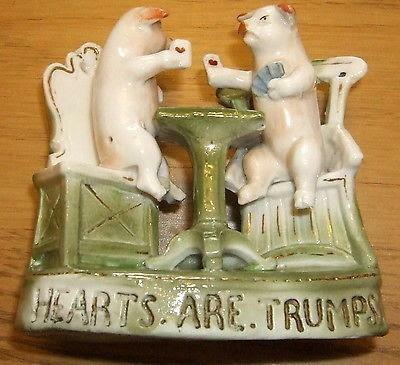 In the newspapers, a story was circulated about this: 'a story good enough to be quite true is going the rounds with reference to [Millais'] 'Hearts are Trumps' in the Academy. I may promise I do not believe either egg or shell of the anecdote, but here it is:- Mr Armstrong was dissatisfied with the portraits, and chiefly with their 'motive'. 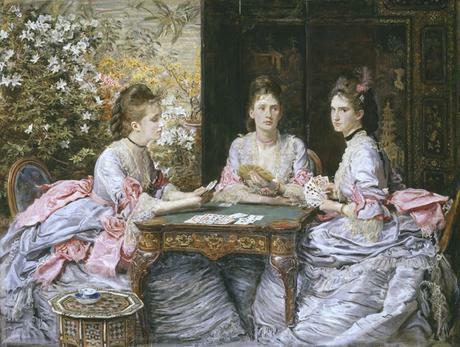 It was indiscreet of Mr Millais to paint his daughters in the act of playing cards. "Well," the artist is reported to have replied, "you need not have the picture unless you like. If you don't have it though, I shall clap an extra thousand on the price, and call the work 'Wanted: a partner'"(from the Forres Elgin and Nairn Gazzette, 21 July 1872). In this rather dubious anecdote, it is made clear that the painting is about the girls' marriage status, and also it seems that only one partner is required. Putting this together, and considering the Montgomery sisters and the symbolism of the statue, it becomes clear that one of the Armstrong sisters was not like the others. The portrait was painted in 1872 and it is clear that Mary Beatrice, far right, has a very advantageous hand. She was engaged to Rowland Ponsonby Blennerhasset (brilliant name) and married in September 1876 and she had ever right to be confident in her hand. Her Irish Hole Rule, Queen's Counsel husband did very nicely for the family. By the time of her death in 1928, the widowed Mary left her son over £19,000. Next to her, also behind the Chinese screen, is seated Diana, middle daughter of Walter Armstrong. Her attitude to her cards is very interesting as she looks to her sister rather than the game. She too was probably engaged by this point as she married a few months before her sister in April 1876. She married John Herbert Secker, a barrister, who at his death in 1903 left his wife and children £51,000. Good lord! 'Hearts Are Trumps' (1866) for a stereoscope and allegedly inspirational to Millais. Allegedly. The sister not sat in the darkened space of the screen, Elizabeth, had to wait until 1883 in order to find her 'partner'. It is suggested therefore that the dummy hand facing the viewer is for a partner to come and join her. She married Charles James Tennant Dunlop, but the marriage was not to be a long one as he died in 1899, leaving her £4,000. By the standards of the women listed in this Blogvent, the sisters did very well, had long lives and many children. Splendid. Nineteenth century piggies playing cards. And why not? Turning back to painting, it had a somewhat more varied life. Walter Armstrong, whether he liked the painting of his wildly gambling daughters or not, purchased the piece, but in the same year as he married off two of his three girls, a fraud on the London and Westminster Bank bankrupted him. 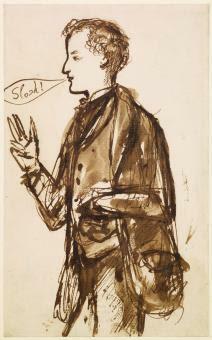 His art collection sale was reported in the Art Journal of 1876: 'Among the pictures belong to [Armstrong], the only one worthy of special record was Mr Millais's 'Hearts are Trumps', the large painting of four (sic) ladies, daughters, it is generally understood, of Mr Armstrong, playing at cards; it was exhibited at the Academy in 1872 and bought now by Mr Agnew for 1,300 guineas.' The picture however was saved for the family by Diana's husband, John Secker within 2 years. The painting was frequently lent to exhibitions it seems, if newspaper reports are to be believed, and at a 1898 private view of a Millais memorial exhibition, it was noted in the Pall Mall Gazette that Diana Secker was one of the viewers in the gallery, as well as being on the wall. The painting passed down to her son Walter, then to the Tate in 1945 for the lesser sum of £1050.